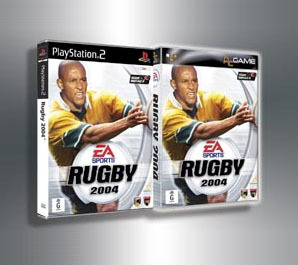 Rugby, the game they play in heaven can now be played on your PC, PlayStation 2 or Xbox in your own lounge room with EA Sports latest sporting title Rugby 2004. 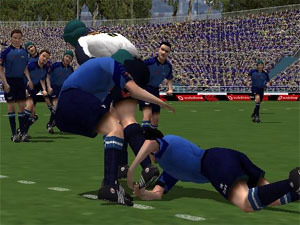 The timing of the release could not have been better with the Rugby World Cup 2003 due to kick off in Australia in mid October. The game is laid out in typically EA Sports fashion with an attractive simple menu system. The sport of rugby union can seem quite hard to fathom for the uninitiated like myself and I found the easiest way to get up and running with the game was to use the training mode where you can hone the basic skills you need in open play, line outs, scrums and goal kicking. There are a lot of different skills that you will need to have a basic grasp of before you set off to play your first test match. The voice of rugby, Gordon Bray gives you hints on what to do in scrums and line-outs. Also the wonderful manual supplied with the game gives you a run down of basic rugby rules, what each button on your controller can do in attack or defence and is easy to read and well laid out and I found is good to use as a reference on some of the finer points of the sport. Once you think you are ready to play you have a mouth-watering choice of teams to play for or against. All the major club teams from the southern and northern hemisphere plus the top 20 international teams and a few invitational teams thrown in for good measure such as the legendary Barbarians or the British Lions. EA has the license from all these unions so all the team�s logos and jersey designs are there to add to the realism. 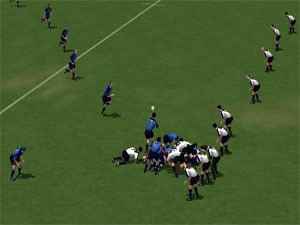 On top of this you are able to play in tournaments such as the 2003 Rugby World Cup, Tri-Nations, 6-Nations, a British Lions tour, Super 12, European Club Championships or you can even create a fictitious World League where you choose the teams to play and even trade players with the other teams competing. On top of the excellent variety of teams you have a massive choice of venues to play your matches in. The artists have gone to wonderful lengths to recreate legendary venues such as London�s Twickenham, Eden Park in Auckland and Sydney�s Stadium Australia plus there is loads of stadiums not typically associated with rugger such as the MCG, Adelaide Oval and even Subiaco Oval in Perth. It creates a truly great atmosphere for your games. I found only a minor drawback with the stadiums was the spectators themselves. They appear to be cardboard cut-out like when viewed close up and not as good as you find in the latest sports simulations on the market. Having said that it makes little difference to detract from the spectacle of the game. The game play itself I found was excellent and challenging. It is after-all the most important aspect of the game and is very well recreated. There are three different modes to play easy, normal or hard. I found that in normal mode it was possible to just about beat any team by relying on being able to out sprint and outrun the opponent by using lots of passing. On the hard level, which is much more realistic in compared to what you see in real-life rugby, you must be able to employ all the skills to beat your opponents even if they are relatively mediocre strength wise. You must be able to kick for touch well to gain yardage, as well as win your line-outs and scrums, make dummy moves and hand off tacklers. Simply being able to outrun teams won�t get you into scoring positions which makes the game far more satisfying to play and an all round game rather than just being able to take shortcuts so I found there is good durability in this game as well as being well presented and playable. A lot of what your players can do out on the paddock depends a lot on their abilities, for example a forward will not be able to out sprint a back or certain players are inappropriate for kicking in open play because they do not have the correct attributes for it. Essentially you need a fair bit of practice and know your players strengths and weaknesses to be able to win in the �hard� mode. Other variables that influence how players perform are weather conditions, such as wind, temperature, pitch condition and geographically where the match is staged. A home team generally plays better and also a northern hemisphere team plays better in the cold and mud that a team such as Australia who can play better on hard tracks in warm or hot conditions. The set plays such as scrums, line outs and goal kicking take a bit of practice and are vital to master because they are essentially a game within a game as you need to win them in order to control possession of the ball. 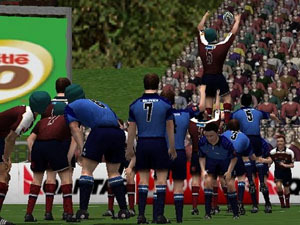 The scrums and line outs offer the player the chance for moves such as selecting which player you will throw the ball to in a line out or which player you want to run in a certain direction after the ball is cleared away from a scrum. If you have played a gridiron simulation such as Madden it is quite similar. Kicking conversion goals or penalty goals is quite straightforward. It is similar to a golf sim where you will need to judge the strength of the kick, taking into account factors of wind and angle. I found it to be quite in line with the rest of the game and not to detract from the playability. Graphically the game is very good. The player representation is around the level EA�s that FIFA, NBA and NHL were around the year 2000 so you can recognise some of the legends running around like Wendell Sailor or Johnny Wilkinson. Player movement is quite good and only a few instances is there a few things appearing visually that look out of place. Sometimes the players appear to move suddenly in a particular direction and then suddenly in a complete unnatural way akin to a few frames missing from a film reel. But really it is a minor complaint and does in any way detract from the way the game is played. The sounds are pretty spot on, the crowd�s noise level rises and falls when a player makes a dash for glory. Spectators grumble disapprovingly when the home team loses a scrum feed or line-out and cheers wildly for a sneaky drop goal conversion. Unfortunately the singing of Swing Low Sweet Chariot at Twickenham when England is on the charge or other rugby crowd chants famous throughout the world is not available in this edition but maybe this will be in the instalment of the game. Match commentary is provided by BBC�s rugby commentator John Inverdale and Seven's Gordon Bray. Occasionally Gordon gives hints as he does in the training mode. With the commentary it was quite good but occasionally a little repetitious which is quite the norm in a game as complex as this. INXS does the start-up screens and there is a fitting fast tempo menu soundtrack befitting what you expect from your typical EA sports game. Finally I have to say I am very impressed with Rugby 2004, it will not only impress the true lovers of rugby union but also those who have little or no knowledge of the sport. Definitely one for the sports lovers to have in their games library and one that you will keep coming back to play again and again. My rating is 4/5.